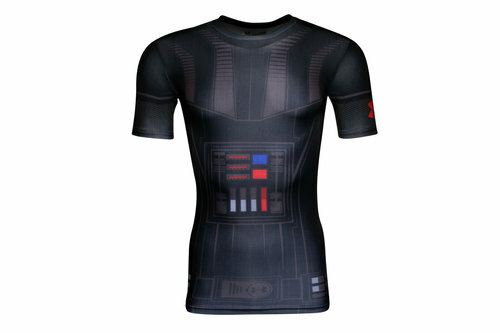 The force is certainly strong in this one so become a master on the pitch in the Star Wars Vader Compression S/S T-Shirt. Made by Under Armour from lightweight polyester and elastane, the compression fit gives your muscles an extra boost to charge into action. Hidden in the fabric and waiting to be unleashed is HeatGear to help keep you cool and fresh as the action heats up. With 4-way stretch material allowing for greater mobility and to maintain shape, the smooth flatlock seam construction puts pay to any irritations. The shirt is even equipped with UPF 30+ to protect your skin from the sun's harmful rays so you can remain active as the temperature rises. An official STAR WARS © & ™ Lucasfilm Ltd product.